Host of the 2012 Westcountry Storytelling Festival, Embercombe has a long history of supporting people in bringing their gifts and message to the world. Speaking Out is a taster of Embercombe’s dynamic and engaging two day public speaking programme for people who wish to communicate with impact and authenticity. Explore the source of your passion to communicate. Release your voice and free up your body. Locate an internal centre from which you can speak with confidence as you hone your approach and develop a new and exciting relationship to speaking out in the world on behalf of what you love. ‘Inventor’ – that’s what you’ll find on Tom’s business card. He’s inventing all the time, but not in the “I’ve finally perfected the coffee maker” way. More in the “I’ve just invented a new way to connect people” way. Tom talks about THE GROOVE rather than the drums. Yes, rhythm is universally popular but it’s the outcomes of people making music together that are important. Belinda originally trained as an actor and worked for many years in theatre and film spending four years as a leading actress at Shakespeare's Globe Theatre. She joined Olivier Mythodrama in 2003 and is now an experienced programme leader and coach delivering courses and using stories/myths to engage people on themes of leadership. Having studied for 20 years in many fields of personal and spiritual development, she has a keen interest in her own and others personal transformation. Lesley Joy Quilty is a senior associate with Olivier Mythodrama, a consultancy that uses great wisdom stories, theatre practices, and insights from archetypal psychology to develop leaders across the globe. She is also a professional clown doctor, mother, TED talker, and long-term member of the Findhorn Foundation Community in Scotland. Caspar has over 20 year’s experience facilitating groups, leading retreats and as a personal guide and mentor. His work was initially borne out of the need to heal the many challenging experiences in his early life. He continues to find inspiration for life and work through meditation, the natural world and the creative arts. He has worked as a resident retreat leader at Sharpham House, Devon as well as running residencies and retreats throughout the UK since 1999. He is an author, journalist and poet and founder of the award-winning charity Write to Freedom. His journey through life and work is guided by a passion and belief that creative expression, nature connection and mindfulness lay the foundations for a reflective, joyful life. Emily runs her own practice as a Wellbeing coach frequently combining coaching with meditative techniques and mindful practice. She has a long standing interest in meditation, being a part of her life for over 20 years. She has given talks and workshops on meditation and the effect of living and working with self-awareness. She is also a massage therapist and reiki practitioner. She combines her skills in these various areas to run her fulltime practice. As part of her work Emily delivers massage, reiki, wellbeing coaching, and meditation clubs both for staff and students in three different schools. Her aim in all her work is to bring space and peace into people’s lives so that they can, through their own self-awareness, see what will help them on their journey and what can be let go of. You are invited to join together in a healing circle for an encounter with our sacred hearts through music, song, prayer, meditation and laughter. Joined in intention and with song and prayer as our bridge between worlds we will create together a healing field of love, appreciation and gratitude for this gift of life we are blessed with. Moshe and George bring a blend of both experience and training in Classical guitar, indigenous traditional music, voice work, medicine work, meditation and Transpersonal group work. They bring songs and prayers to share from many traditions, as well as their own. They are honoured to be joined by Aura Rascon on the Bansuri - Indian bamboo flute, who has trained extensively with the great living master of Hindustani Classical music and Bansuri virtuoso - Hariprasad Chaurasia; and by Erika Tourell who brings many years of teaching and deep immersion in the vocal traditions of yoga and plant medicine. Please bring music, prayers words or stories you might wish to share, or just enjoy, relax, heal, celebrate and transform in the space we create together. Circle of Life is a medicine circle where the medicine is what lies in our hearts. Whilst there is no use of any form of plant medicines, our circle is a direct link with the ancient ways of our Grandmothers and Grandfathers and we honour both the the sacred plant and spirit traditions of our ancestors. Ollie Frame leads mindfulness and nature connection retreats at various centres in Devon, including Sharpham House. He runs 8-week courses for members of the public as well as for adopters and for teachers and students within schools and colleges. In his private practice, Ollie also works as an Integrative therapist and has a particular interest in Psychosynthesis, depth psychology and inner journeying. Within the world of mindfulness, he is especially enthusiastic about self-compassion, metta meditation and other heart-based approaches. with a background in Indian Bharata Natyam and other global and western dance genres, Olivia has since branched out to regularly teach Bollywood dance and Middle Eastern Dance, as well as creative expression in schools, colleges and within adult education. With experiences including work in education and forensic settings, as well as performances for Bangla National TV and the Indian Film Festival At London South Bank, Majenta Dance has developed over the years to be able to offer diverse performances, along with her own dance group, The Jewelled Bedlah. I am a storyteller, changemaker, poet and published author, currently researching my latest book - a three stranded story set in the Utopia of 2050, when the children of the future ask how we got there. We go back to our times, as well as the mythic ancient past, and hear how people now realised that it was through our inner journeys that we could make a difference. I am passionate about people, stories and transformation. The Quest to 2050 - In this workshop we will co-create the future you would like to live in. Through storytelling, visioning and an interactive game, as a participant you will be led on a journey to visualise your own future as well as how you envisage our world in its most positive guise. Participants will leave the workshop knowing what step to take next in their own lives and any visions that they agree to share may find their way into a book which is creating the future from the dreams of those who care. Most suitable for adults and young adults. (Children under 12 to be accompanied). 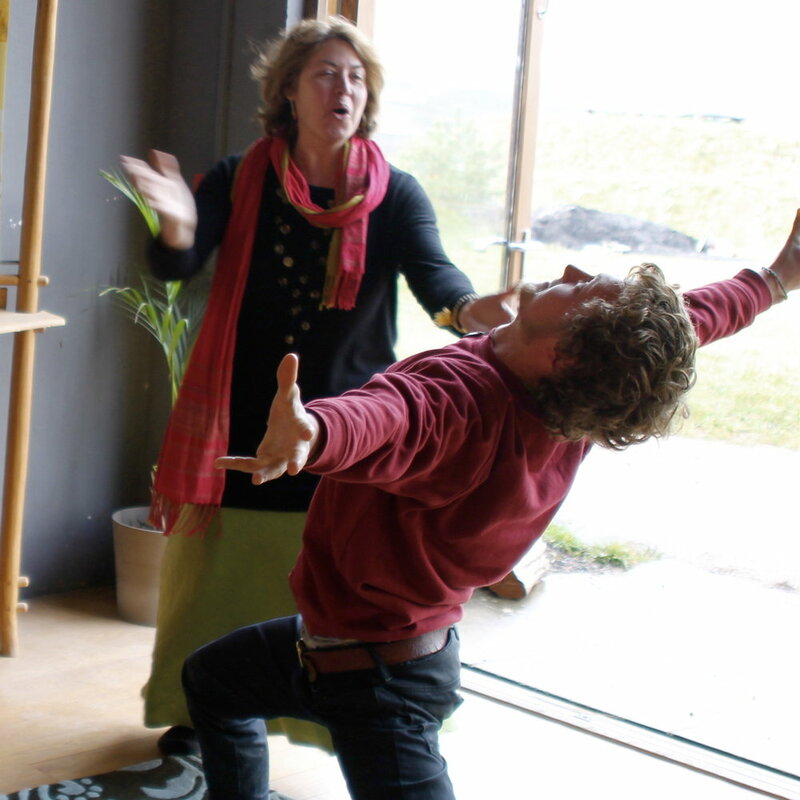 Joe Hoare (#laughteryogawithJoe) is an experienced laughter yoga specialist. He has pioneered innovative approaches to laughter yoga since 2002 and started training others in these skills in 2006. His approach is the practice of joyfulness, and it stimulates genuine, natural, spontaneous expressions of joy, aka laughter. This approach welcomes, encourages and stimulates individual creativity and personal growth. His clients range from blue-chip, to media and healthcare, to charities and festivals like Glastonbury Festival and the World Yoga Festival. He has lived and worked in the US and China. His work features regularly in the media, most recently on the Jeremy Vine show on Radio 2. Wyld Experiences arrange and provide immersive retreats in nature for pregnant women, parents to be and new mums. Weaving together nature connection, hypnobirthing, yoga, nutrition, overnight experiences in the Wyld, a woodland spa and more. We support women and their partners through the transformational journey into parenthood and beyond. During the festival we will be holding a nurturing mothers fire for anyone to pop in for tea and cakes, a chat, a read or even a snooze on a skin or hammock. Come and share your stories, hear others, add them to our tree of birth stories, paint a picture and let nature nurture you. We will also be holding space around the fireside on Saturday night to share 'Stories of the Mother', an intergenerational exploration of birth stories from grandmother, mother and daughter.